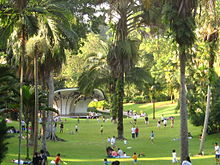 The Singapore Botanic Gardens is the only tropical garden to be inscribed by UNESCO as a World Heritage Site. Esplanade performing arts centre, fronting Marina Bay. Tlācatlahtohcāyōtl Singapur ahnōzo Singapur (Indonesiatlahtōlli: Singapur), tlācatiyān īpan Asia. Singapur ītēcuacān ca. Inin tlahcuilolamatl omopatlac immanin 26 Icchicuace m 2016, ipan 10:50.